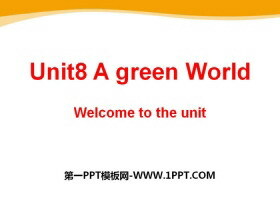 《A green World》Welcome to the UnitPPT 第一部分内容：学习目标： 1.能准确运用有关如何?；せ肪车谋泶?。 2.能就环保的话题展开讨论。 3.培养学生?；せ肪车囊馐?。 Warming up Did you know that all around the world, 3 t..
《A green World》TaskPPT 第一部分内容：Presention This picture is very simple. adj. 简单的 step n. 步骤; 措施 power n. 电力; 力量 Brainstrom 1. What can we do to save water? 2. What can we do to save power? 3. 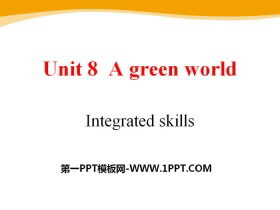 ..
《A green World》Integrated skillsPPT 第一部分内容：speak loudly What is the green world like in your mind? （What can we see? What do people do? What about pollution? the sky? the rivers......?) 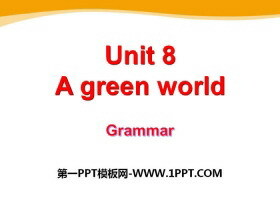 Discussion: Wh..
《A green World》GrammarPPT 第一部分内容：Objectives To learn to form the passive voice in the simple future tense To learn to use the passive voice in the simple future tense Switzerland is a beautiful country..
《Intemational charities》PPT 第一部分内容：Passive Voice Translate the following sentence into Chinese. 1. The plane is also used as a training center. 2. 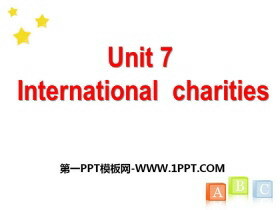 Also, local doctors and nurses are invited on board to..
《Intemational charities》TaskPPT 第一部分内容：Charity show Amy wants to write about the work of an ORBIS nurse called Diana for her class Presentation. She found these pictures of Diana. 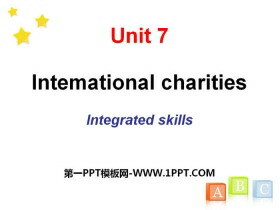 Diana was a secretary..
《Intemational charities》Integrated skillsPPT 第一部分内容：Check the preview 重点词组 1.为 提供 provide for 2.做些义工 do some voluntary work 3.联合国 the United Nations 4.成立于1946年 be set up in 1946 5.因..
《Intemational charities》ReadingPPT 第一部分内容：Review Translate phrases and sentences. 1. 剩下一些零花钱 have some pocket money left 2. 太虚弱以至于不能走的更远 too weak to walk any further 3. 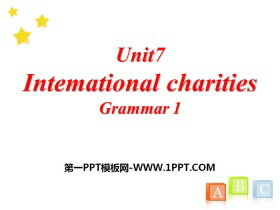 吃一顿丰盛的..
《Intemational charities》GrammarPPT课件 第一部分内容：When to use the active voice? Its important to know who performs the action. The ORBIS doctor do operations on the plane. 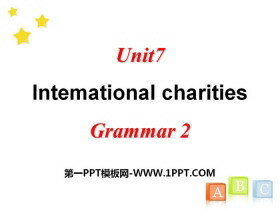 It is obvious(显然) who performs ..
《Intemational charities》GrammarPPT 第一部分内容：Active or Passive 1.The lights were turned off by Tom. 2.The windows are cleaned every week. 3.Millies closed the door. 4.The TV was turned on. 5.The boy made ..
《Sunshine for all》Welcome to the unitPPT 第一部分内容：New words the Olympic Games = the Olympics We should support our national athletes at the Olympic Games. blind adj. 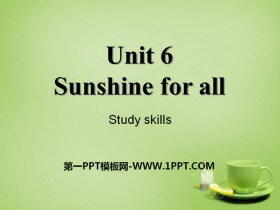 盲的 We should help blind people cros..
《Sunshine for all》Study skillsPPT 第一部分内容：翻译下列短语。 1. 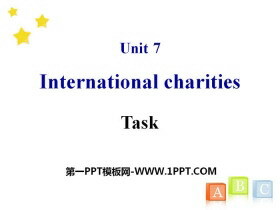 在周末at the weekend 2. 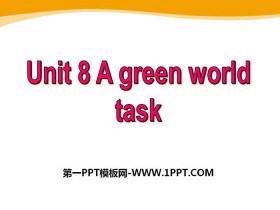 超过，多于more than 3. 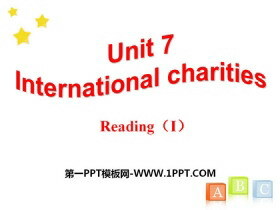 改善他们的生活improve their lives 4. 在我们的日常生活中in our daily life 5. 节约你的零花钱save ..